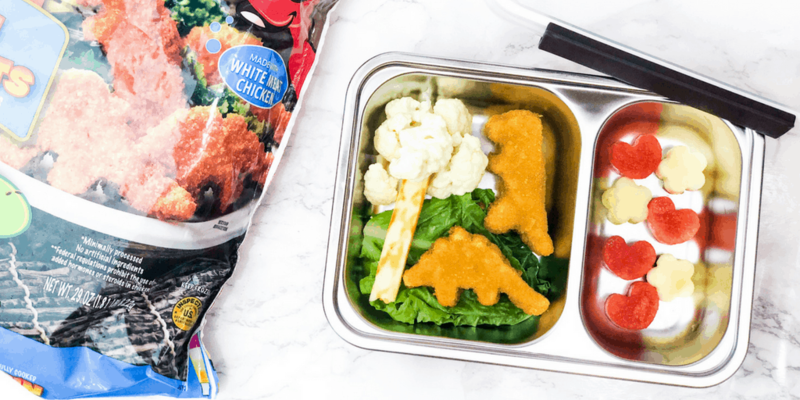 This dinosaur lunch uses dinosaur shaped chicken nuggets and fun fruit and veggies to create a dinosaur themed bento box lunch for school! 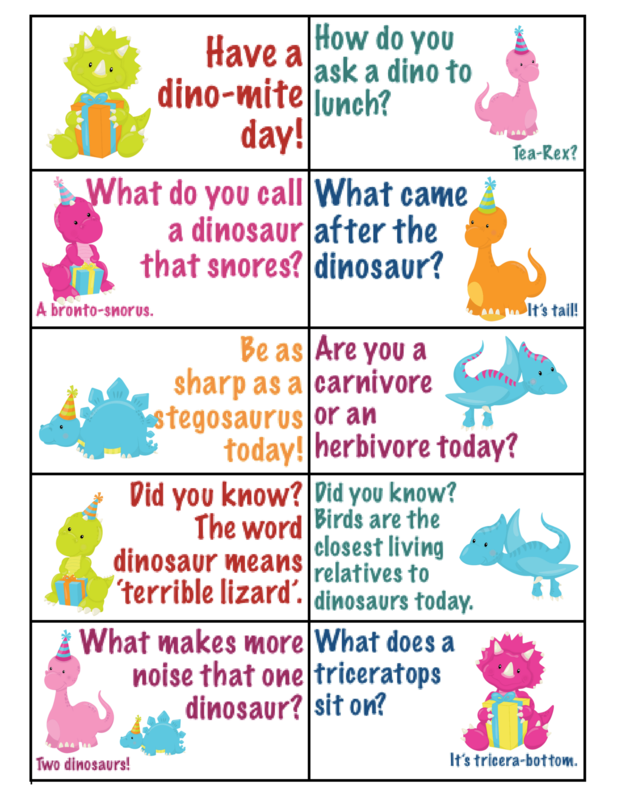 Also included are free dinosaur lunchbox notes to print. Kids just love a themed lunch. 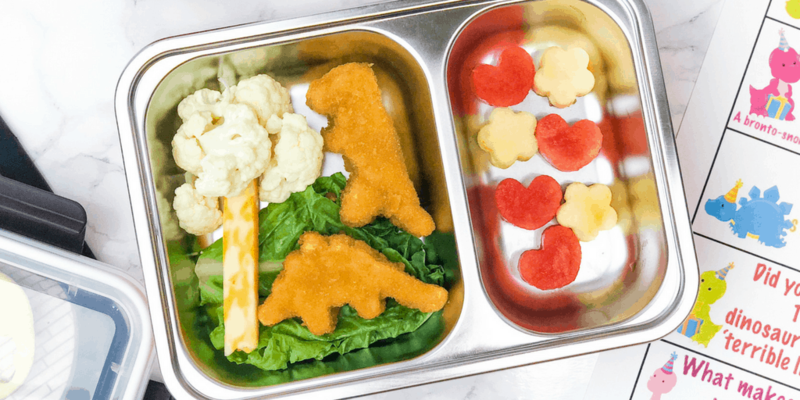 Imagine opening your lunchbox in the middle of the day and finding a cute, themed display inside! This sounds like a lot of work, but it can really be so easy – sometimes as simple as nicely arranging just a few ingredients. 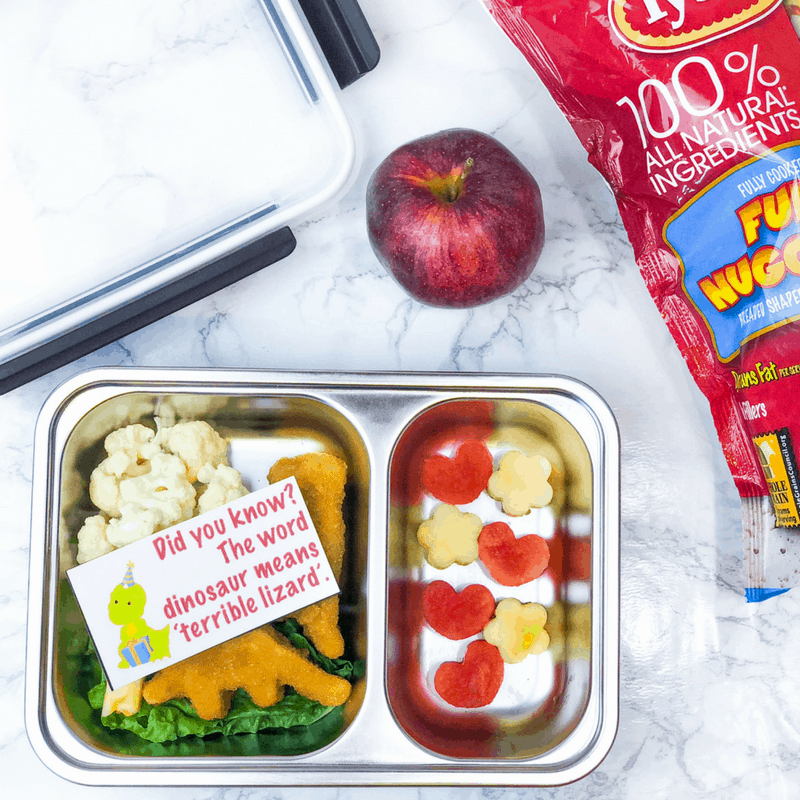 Check out how we use Tyson® Fun Nuggets (dino shaped) to put together a quick and easy dinosaur lunch kids will love! Did you know, birds are the closest living relatives to dinosaurs today? Or that the word dinosaur means ‘terrible lizard’? Dinosaurs are fascinating and kids seem to just adore them. My little ones have a particular affinity for Tyson Fun Nuggets, and so do I. 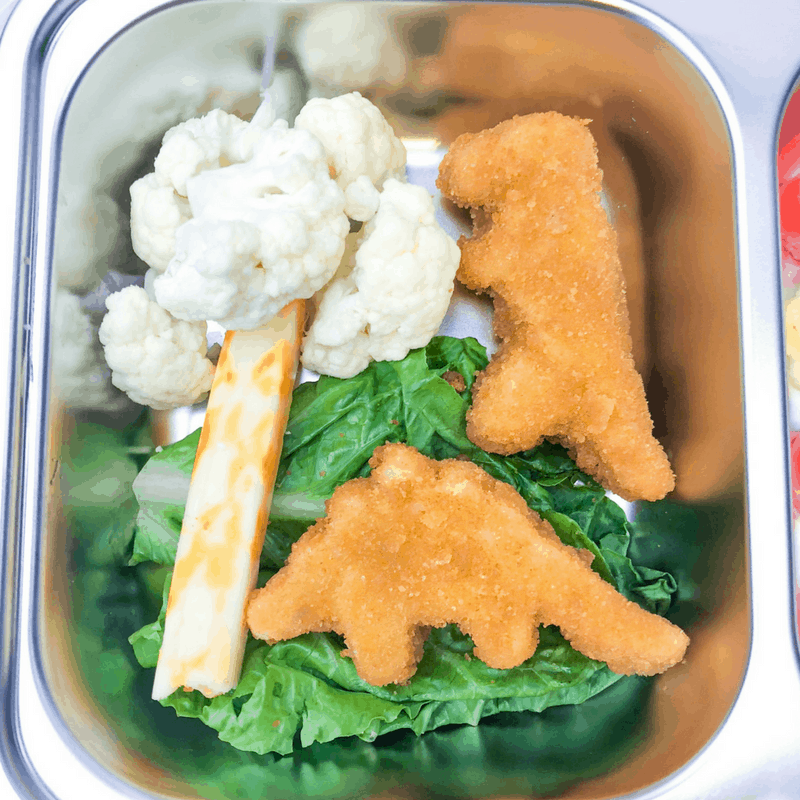 See how we use them to make a dinosaur lunch that kids go crazy for! Arrange the bento box lunch by placing lettuce down as a base. On top of the lettuce, arrange the dinosaur fun nuggets. Give the dinosaurs a tree to munch on, because playing with your food can be fun! We used a cheese stick as a tree trunk, but celery could be a fun alternative here. On top of the tree truck, add some broccoli or cauliflower leaves. 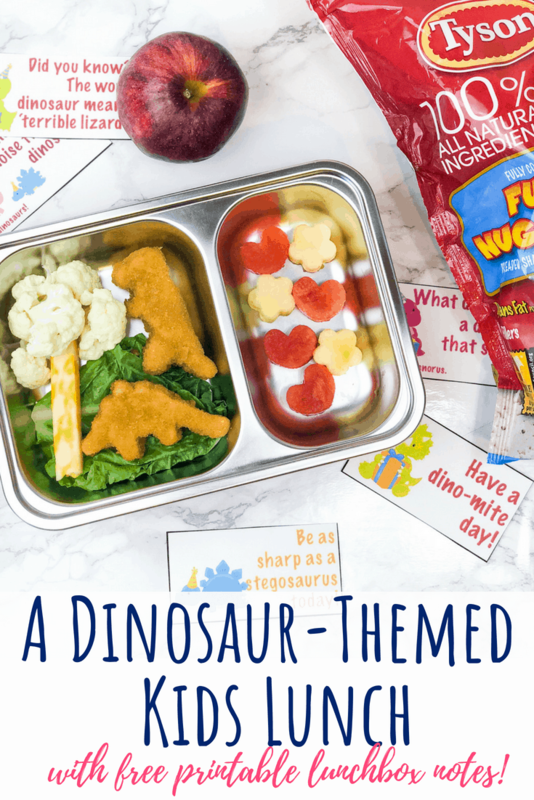 These are so fun for the dinosaurs to eat, and the kids can show them how! 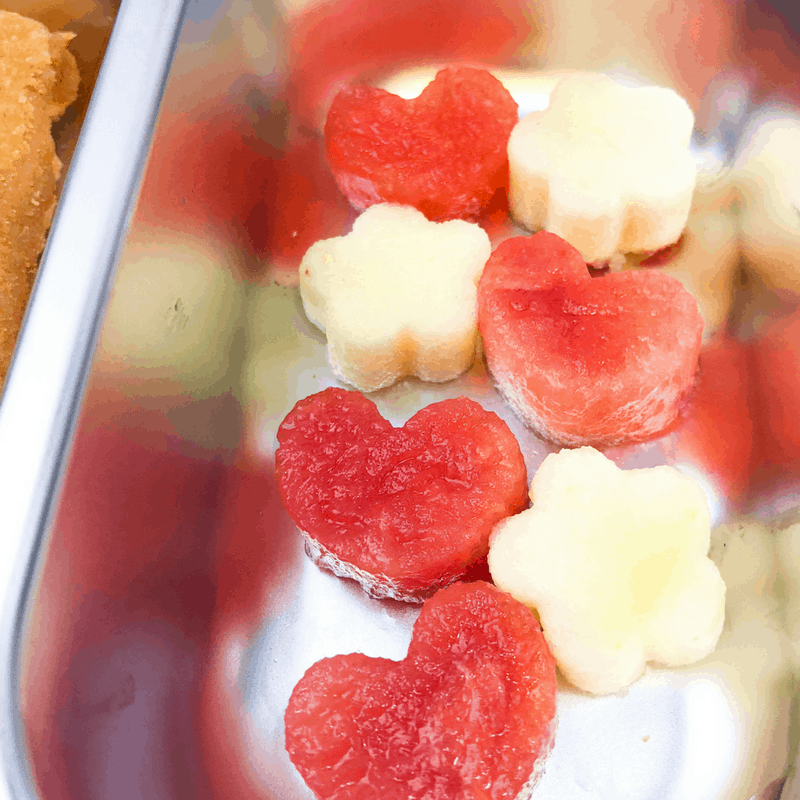 Use cookie cutters or bento box kit cutters to make some heart and flower shaped fruit pieces. We chose watermelon and apple for these. It’s really amazing that by creating a theme and some fun shapes, kids all of a sudden love eating a variety of foods! 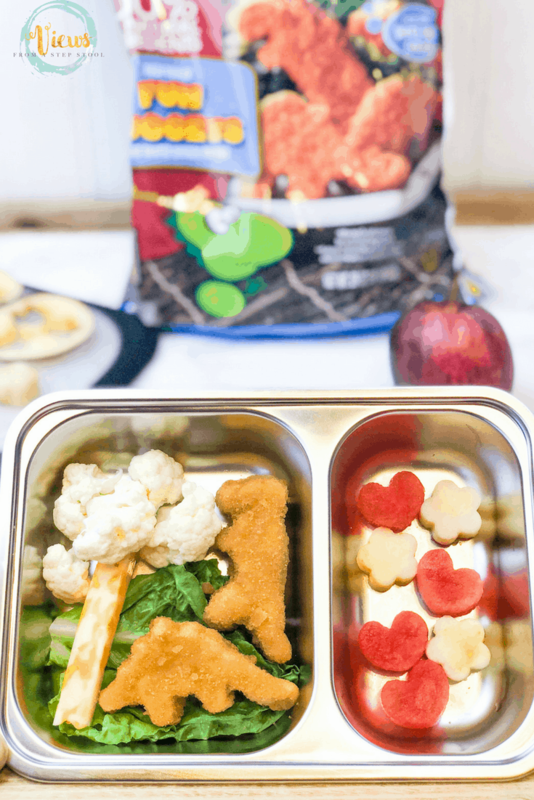 Because chicken shaped like dinosaurs and watermelon shaped like bite-sized hearts just taste better. 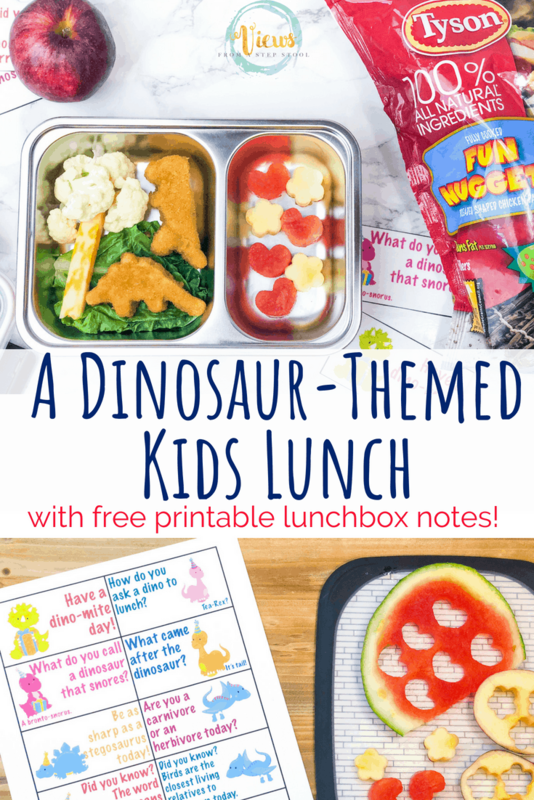 These free printable lunchbox notes make a great addition to your dinosaur lunch for kids! Simply print them out, cut them up, and place one in your child’s lunch. These can be great year-round, but especially during back-to-school time as your children can share them with friends, serving as ice breakers for some of the nervous jitters. Did you know birds are the closest living relative to dinosaurs today? The word dinosaur means ‘terrible lizard”. These are so fun for kids! Click on the image to grab them below and add them to your dinosaur lunch. Back to School with Teen Titans Go! Teen Titans Go! To the Movies is teaming up with Tyson Foods, Inc. to bring your family food that will help kids learn like a Teen Titan. Take the quiz here to find out which Teen Titan your child is! 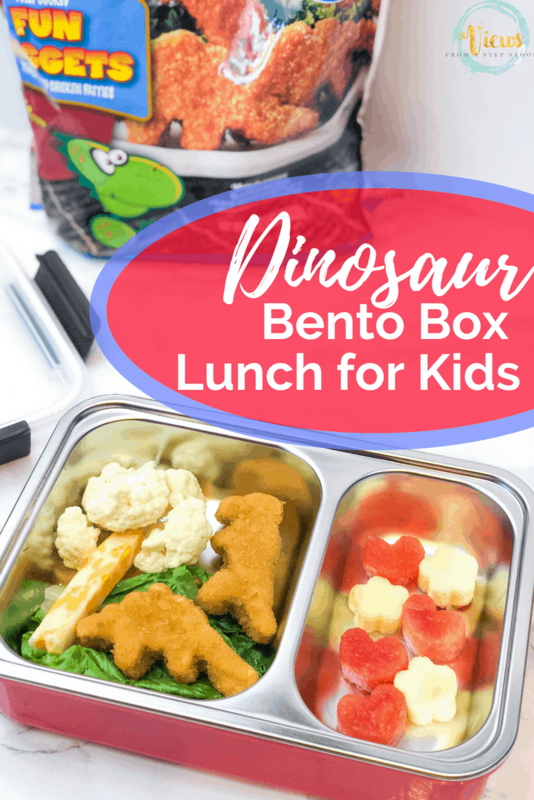 Between the Teen Titans and this fun dinosaur lunch with lunchbox notes, your kids will be more than ready to head back to school!